Rodney Leon, president and co-founder of AARIS Architects PC, has enormous respect for Black culture and its influence throughout the world. He speaks passionately of its architectural aestheticism and ingenuity, which is evident in his own designs, perhaps nowhere more so than in the African Burial Ground memorial in Lower Manhattan, a project he is developing into a historical and philosophical landmark. 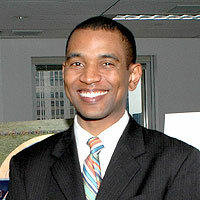 Leon was one of five designers selected from the 61 applicants who responded to a call for proposals on the project in 1998. Named the official designer in April 2005, he considers the venture a significant career achievement through which he will make an impact on future generations. ?The project represents a contribution to culture and the history of our people. It is a big responsibility and I feel blessed to have the opportunity,? he says. Leon recalls watching his uncle, an architect and engineer, as a child, and admiring his books and drafting tools. It came as no surprise, then, when he received a bachelor?s degree in architecture from Pratt Institute and a master?s in architecture from Yale University. Architecture in general is one of the more difficult professions, but it is an especially challenging field for Blacks to enter, Leon contends. He accepted the challenge, and partnered with a colleague, Nicole Hollant-Denis, to establish AARIS Architects P.C., a firm specializing in residential, commercial and institutional projects. As one of a handful of licensed African-American architects, he is able to seize opportunities locally and globally. He and his colleagues make a point of nurturing relationships with African-American churches, community organizations and other non-profit groups. Their firm currently is developing an affordable housing project for New York City and a sustainable housing development project in Haiti. Leon has turned his passion for architecture into a moral obligation for building communities. His goal is to design projects that have a significant historical and cultural impact upon society, with emphasis on public institutions that focus on the contributions of people of African descent to humanity.